Boston is a unique and historic city. In fact, it is one of the oldest most storied cities in our nation. Sometimes, we forget to appreciate what makes our city one to which millions of tourists are so excited to descend upon each year. So don’t miss out on the fun but make sure to schedule a date to play tourist for a day! Enjoying revisiting some old spots with fresh eyes or even learning a new thing or two about your city is a fun way to connect with your significant other. Don’t let the out-of-towners have all the fun! Here are some quintessential Boston date ideas to have all to yourselves. With a nod to Boston’s famous nickname, Top of the Hub is an iconic Boston restaurant perched 52 floors above the city in the Prudential Tower. They boast some of the best skyline views of the Hub and beyond here. Top of the Hub is a classic place to splurge on a romantic atmosphere with a very authentic Boston back drop. The vibe is different with a day time view versus city night sky but either time you choose the atmosphere here just feels special with a very old school Boston appeal. Enjoy fine local seasonal cuisine for lunch or dinner in the main dining room (as a side note for a special treat request a window seat if making reservations ahead of time). There is also a lounge side to grab drinks, lighter fare, or cap off a night with cocktails and dessert all while enjoying live music. Quintessential Boston romance done right! Got a date with a trivia buff, history fanatic, or just someone who appreciates the rich history of our beloved city? The Omni Parker House is the place to take them! An amazing place to wine and dine in its own right, the Parker House is a living monument to some of Boston’s most iconic moments. As the longest continuously operating hotel in the United States, many a politician, sports hero, and literary legend has dined at the Parker House. Not only did Babe Ruth and other sports greats unwind here at one time but Charles Dickens, Ralph Waldo Emerson and other members of the famed Saturday Club dined at Parker’s Restaurant. Have a very special date coming up? Snagging a reservation at Table 40, where it is said that JFK proposed to Jackie, is sure to impress! Foodie companions will be impressed with the dining history here as well. It was in this kitchen some legendary Boston cuisine was invented such as the delicious Boston Cream Pie, Boston Scrod, and the Parker House Rolls. Parker’s Bar and The Last Hurrah offer lighter fare and drinks with the same ambience of living boston history. The Last Hurrah offers a great selection of Bostonian Whiskey and inventive martinis including (of course) the delicious Boston Crème Pie martini. The Omni Parker House is located along the Freedom Trail offering an opportunity for a historic après cocktail stroll while impressing eachother with your best Boston trivia. Is there anything more quintessential Boston than a Fenway frank in one hand and a seasonal Sam Adams beer in the other while cheering on our beloved Red Sox? Probably not. Fenway is the oldest and arguably most iconic ballpark in the United States. Sports is an integral part of Bostonian life and Fenway Park, having been home to the Red Sox since April 20, 1912, is an essential piece of that. There is really not a better way to pass a beautiful afternoon or evening here in Boston than at Fenway Park when the Sox are in town. Even if you are not a huge fan of baseball in general, there is just something about this baseball park nestled in the midst of the city that makes it a special place to be and share some time with your favorite date. Tours are available year round from 9-5pm on most days and can be purchased online in advance or there are a few available daily for purchase at the park. Combine that to a visit to one of Fenway’s many amazing local bars and you still have that classic baseball in Boston vibe. The Bleacher Bar is a great choice for getting as close to the action as you can without actually having a ticket – offering a view of the park and located below centerfield. Also check out the longstanding Fenway favorite Cask ‘n’ Flagon for a classic Boston sports bar experience. You really can’t be more Boston than a date in Fenway! As a harbor city, Boston is known for its very New England seafood specialities and a date out for some fresh local fare is an essential Boston experience to share together. There is no lack of amazing restaurants and bars to find great seafood in this city but no location combines historic Boston institution with fresh local seafood better than the Union Oyster House. First serving up food in 1826, it has the distinction of being our country’s oldest restaurant. Along with its impressive history, some very New England cuisine is served up from the Union Grilled Oysters, steamers, clam chowder, and lobster rolls to a few twists on favorites like the lobster ravioli. A side of Boston Baked Beans and house baked corn bread and you are eating some quintessential Boston right here. The Union Oyster House is located on the Freedom Trail and near Faneuil Hall so some strolling and shopping after dining can also be part of the experience. This is a place steeped in local history (and with some great classic seafood), but if it feels all too touristy for you and your date than head over to Neptune Oyster in the North End. Neptune Oyster offers a more upscale modern ambience and menu along with award winning local seafood and cuisine. If you and your date equate eating fresh seafood with ocean views, then head try Legal Harborside. Legal’s Seaport District location is a great place to snag a table on a rooftop lounge for some amazing classic seafood and waterfront views. Whichever option you choose, a date with fresh New England seafood on the menu is classic Boston dining at its best. Spend a day date enjoying a distinctive neighborhood of Boston and what it uniquely has to offer. South Boston is a great choice with a lot of character but also more beaches than any other Boston neighborhood. There is loads of history here as well as some restaurants to explore. A great date spent here does not have to be pricey either. 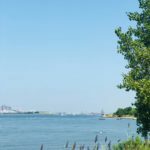 Walk along M Street Beach, Carson Beach, around Castle Island loop then grab some hot dogs or burgers at iconic Sullivan’s (Sully’s serves up some of the best hot dogs and burgers in the city) and you have pretty much experienced a classic summer day in South Boston. If you want to continue your day date out into the evening for dinner/drinks then there are plenty of options here as well. Amrheins is a classic Southie tavern (here they have the oldest hand-carved bar in the U.S.) with a bit more elevated pub food that should be on your list for a dinner/drink stop in the neighborhood. For a newer dining experience in Southie, try the Mexican fare at Loco Taqueria & Oyster Bar. The new juxtaposed with the old is also a very Bostonian experience.